Economic growth is projected to accelerate exceptionally to 4.7% in 2016. Private consumption has received a pro-cyclical boost in the form of tax cuts and wage increases, while fixed investments have also continued to grow. With every expectation of inflation climbing to positive levels and wage increases losing momentum, the consumption boom will settle down in 2017. 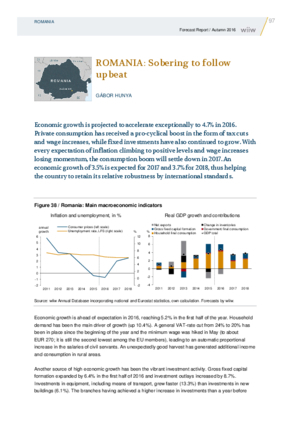 An economic growth of 3.5% is expected for 2017 and 3.7% for 2018, thus helping the country to retain its relative robustness by international standards.